Series 100 raised panel mitered corner doors are specialty design doors. When you view all the black and white side cut diagrams that will follow lower on the page, you will see what we mean. Some of the door frames are wide, some are narrow. All come with only the one edge choice shown drawn with them. Most will have extensive contours in the frame and thus make them great choices for glazed doors. Lots of crevices for the glaze to catch in. They are all available as unfinished, finished, and glazed finished. When you look at the 4 corners of the frame where the top and bottom and sides meet, you see the 45 degree angle line coming in from the corners. This is the definition of a mitered corner door. The frame pieces are cut with 45 degree ends and assembled in a similar fashion to picture frames. All the Series 100 designs are also available as mullion doors and frame only doors. Then additionally, the definition of mitered corner plywood panel doors, series 300, every design below can come with a plywood panel too. All the frame specs are the same. Each design DOES have a matching drawer front design. But options are limited. Because of the way the frames are made, the majority of the frames cannot be lessened in width. Thus drawer front designs will have the same base minimum required measurements as the doors for that design to be made. A couple of the designs do allow modification, and thus the min. height on the drawer fronts can be made smaller. A common trick used to have short matching drawer fronts is to choose a plywood panel drawer front with the same frame profile. Since the sliver of panel in the drawer front is small, this creates a nice look to the raised panel doors. The other option of course is to just have a slab drawer front (solid flat wood panel). We will begin this page with two color photos so you can look at the corners and see what mitered corner means. Then there will be a lot of product info on this page. In the upper border are navigation links to all pages within the Woodmont Doors section of our web site. Some will give you advice on hinges, measuring, installing, etc. We do offer options for on-line quotations and fax quotation requests. All quotations are done by us, not a robot. Allow us a day or two, sometimes three to get back to you. Design 125 door shown with #2 panel and RAD edge. Min. width 7-1/4", min. height 7-1/4". Design 144 door shown with #6 panel and 118 edge. Shown in Cider Maple finish. Min. width 8-1/4" x min. height 8-1/4". This is what the door designs look like "from the front." All mitered corner doors are square top doors only. No cathedral or Roman arch top options. Every design is available in every wood choice listed lower on the page, and can come as UNFINISHED, or in one of the finish options available for the wood choice selected. And below is what the doors look like if you sliced the frame and looked at it straight on from the edge. You can see the measurements for the frames: 2-1/8", 2-1/4", 3", 1-3/4", they are all different. And come only in the size shown. The edge choice, and only edge choice for each is labeled and drawn. These are the RAD, SUN, 118 numbers shown below each diagram. There are two designs with "rope molding" in them. Anything with rope molding will be more expensive, just want you to be aware. Rope molding is fancy, and looks really cool when glazed. But be ready for the price tag. 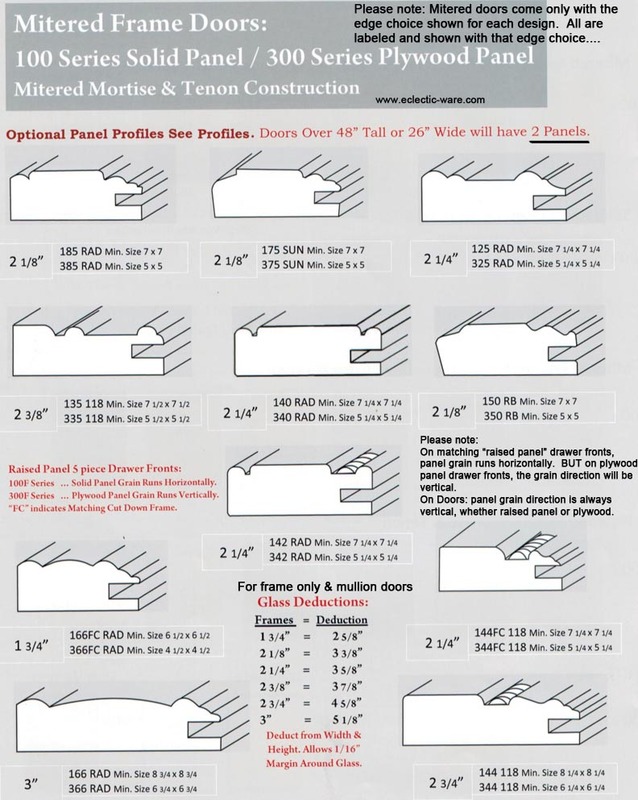 plywood panel doors, frame only doors, or mullion doors. Panel choices are for raised panel doors only. The V-groove, Beaded Panel, and Solid Flat Panel technically are not raised panel. But they are panel selections you can have. If going with series 300 plywood panel doors - You do NOT make a panel selection. For frame only or mullion doors, all of the above except a panel selection applies, then tell us how many mullion lites within each door. Questions? Ask us. 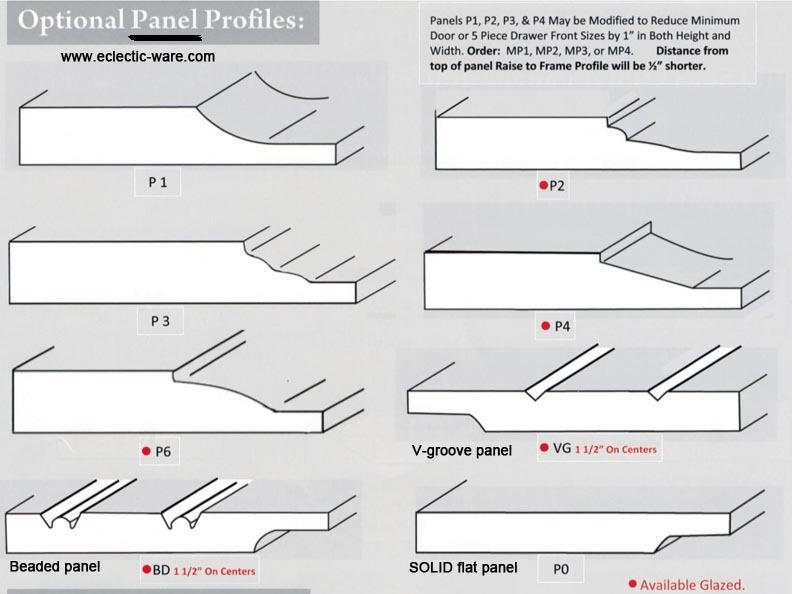 And you will not make a panel selection, the panel is a default flat plywood panel. BUT, if you would like the beaded plywood panel look, then state beaded plywood panel (B). Design 142 door shown with #6 panel and RAD edge. Shown in Cider Cherry finish. Min. width 7-1/4" x min. height 7-1/4". Design 350 door shown with flat PLYWOOD panel and RB edge. Shown in unfinished maple. Min. width 5" x min. height 5". Design 385 door with beaded plywood panel and RAD edge. Shown in Espresso Maple finish with almond glaze. Design 385F drawer front with beaded plywood panel and RAD edge. Shown in Espresso Maple finish with almond glaze. 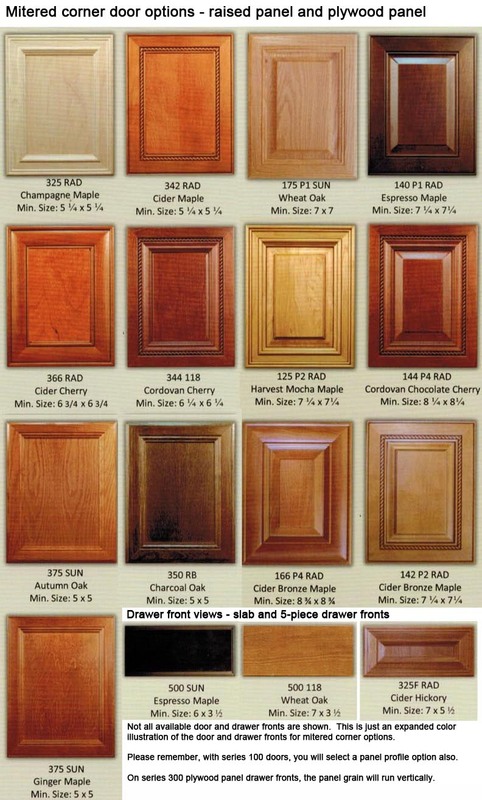 As for door designs 125, 135, 140, 142, 144, 150, 166, 175, and 185 matching drawer front choices are 125F, 135F, 140F, 142F, 144F, 150F, 166F, 175F, and 185F with a minimum height requirement equal to that shown beneath each door picture above. Designs 144 and 166 allow for reduced rail drawer fronts, and those are called 144FC and 166FC. 325, 335, 340, 342, 344, 350, 366, 375, and 385 matching drawer front choices are 325F, 335F, 340F, 342F, 344F, 350F, 366F, 375F, and 385F. And then 344FC and 166FC. I received my doors and drawer fronts today. They are even more beautiful than I expected. I can't wait to start staining them. Thank you for your help in ordering the right drawer fronts. I love them they are a perfect match to the doors. I will be sure to keep your web site in my favorites for future use. Diane B., Racine, WI - ordered design 144 doors and 344FC drawer fronts.